Today I'm linking up with Sarah & Emily in another Fall Favorites post, this one is all about our favorite Fall fashion! I decided to round up my Fall wishlist for y'all to have a peek at today-there are so many yummy textures & colors that I associate with Fall & I cannot wait until the weather is cool enough to get all cozy in these pieces! Fall is definitely a season where I take a little more care when choosing accessories, it's easier sometimes to go with a neutral outfit and pick out stunning accessories to pile on top! My favorite things to pull out for Fall are my boots & booties-the rich browns are the perfect neutral for any dressy or casual outfit. I also love darker bags for this time of year (this is my current Fall bag of choice!) and chunkier larger totes have a piece of my heart too! Although we won't be pulling out blanket scarves anytime soon in Alabama, I can't wait until it's time to pull out my favorite classic one! I'm a huge fan of being casual all-year round, so this cozy quarter zip totally stole my heart. It would be perfect to pair with my favorite leggings or my favorite jeggings, either one! If I'm going to be dressy, you can best bet I'm choosing a stunning blouse in a Fall jewel-tone or a plaid shirt dress, they're so comfortable and the perfect amount of polish. Let me know below, what trends do you love for Fall? What cute picks! 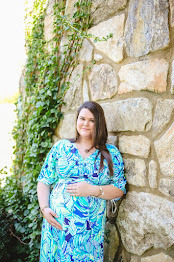 How darling and preppy is the plaid dress! I am in love with that plaid shirt dress! I don't have anything from that store, but I feel like I may need to change that. Thanks so much for linking up! I love that plaid dress especially! The booties are also super cute! Obsessing over that pretty ruffled top! These are great picks! I'm excited to be able to wear zip ups like the one you have! I haven't seen those brown booties out yet, but now I'm totally thinking I need them for this fall! So cute! Love that plaid dress too! I love these fall favorite fashion! These are really stylish and comfy. Cute! I love to snuggle up in oversize sweaters and leggings! Fall fashion is my fave! So excited to start busting all the fall things out! You have such pretty fall favorites. I also love rich brown booties and bags for the fall! I adore fall fashion! That plaid dress is gorgeous! Great picks! 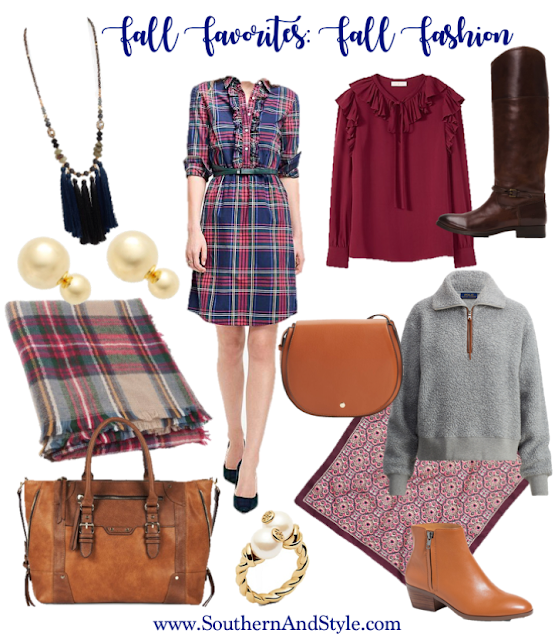 I especially love that plaid dress and think it would be adorable with boots! Gimme all the blanket scarves! Seriously it can start to cool down anytime now. I'm over this heat. These picks are all so cute! I especially lovelovelove that plaid shirt dress! I love wearing boots and booties in the fall! How fun is that dress?!! And I'm really crushing on that bag. Such gorgeous picks! I love that burgundy blouse!! That plaid dress is ADORABLE! All your picks are fab! My fave fall accessory is a good wide brim hat!! Love all your picks!! Ugh I cannot wait for fall! Love all of your picks here. So many good picks! I love those booties!